It’s a new era for healthcare delivery, and a new mindset is taking hold. That mindset requires providers and payers to see consumers in a whole new light. In retail, the customer is king and queen. It’s also now true in healthcare, meaning healthcare organizations need to see consumers not just as patients and plan members, but as satisfied customers. Today, how health insurers and providers deal with consumers is more reactive than proactive. When consumers have a question about their healthcare benefits or to enroll or re-enroll for their benefits, that’s typically when they call, e-mail or text their health insurer. Likewise, when they are sick and need treatment or need help scheduling appointments and finding doctors, that’s when consumers reach out most frequently to healthcare providers. Consumers that shop online or do their banking over the web have high expectations for a sophisticated, convenient and easy customer experience. And now, consumers as patients and plan members also expect the same experience in healthcare, says Neustar Director of Healthcare Advisory Services Scott Bolton. “The consumer is more in charge of managing their own healthcare, and they have very high expectations,” he says. The key to transforming contact centers into proactive customer engagement platforms is data. The healthcare industry is awash in data. As much as 30% of the world’s stored computer data is generated by the healthcare industry. But how data is used in healthcare must be compliant with HIPAA, and is much different than how consumer data is used in banking and retail. Healthcare organizations have lots of outdated legacy systems and reams of data locked away in information silos and not universally shared. The opportunity for healthcare organizations to unlock patient data and use that universal information to transform a contact center lies, in part, with utilizing customer intelligence, identity management and analytics technology. Universal customer data that’s easily accessed and shared can break down information walls and create more universal business, marketing and customer-service goals that increase brand awareness and customer satisfaction. The result can be higher member engagement for health insurers and patient engagement and better outcomes for providers. “Universal data backed by technology can help healthcare organizations first anticipate the needs of plan members or patients, and then deliver the results they expect when they call, e-mail or text,” Bolton says. With better access to universal data, customer service agents at a hospital or health system will have a single view of the patient when they call, including medical history, insurance information, scheduled appointments and preferences. Likewise, when the same technology is used to make contact with customers with outgoing calls or related contact—such as for health benefits enrollment or re-enrollment—getting secure and accurate information to the right plan member in a timely fashion speeds up the enrollment process and helps the member make better, more informed decisions. “Having precise and targeted data available to agents in the call center empowers them to better know who is calling and the likely reasons why,” Bolton says. The healthcare industry is in the throes of an identity crisis—at least in knowing who patients and plan members truly are and how best to serve them. In other industries, such as banking and retail, companies spend lots of time, energy and money sharing and linking data across multiple computer systems and deploying identity management tools that give them a comprehensive view of their customers and what makes them tick. Armed with the right information and tools that provide an instant and complete view of the customer, bankers and retailers are better able to anticipate and solve customer service problems, give consumers a superior customer experience online and offline and develop deeper, more personalized relationships. Not so in healthcare. Healthcare is awash in a sea of data. But much of that data is locked away in information silos and outdated legacy computers that make sharing universal data on patients or plan members exceedingly hard. Hospitals and health systems use their data to see and serve consumers primarily as patients before, during and after delivering care. Likewise, health insurers use their data to serve their customers as enrollees or plan members, especially when they are signing up for coverage or re-enrolling and updating their existing benefits. But healthcare is changing. In a new era of consumer-driven healthcare where consumers are taking on more responsibility for managing their own personal health and wellness and paying more healthcare expenses out of their own pocket, healthcare organizations need to look at consumer data in new ways that better serve patients and plan members as satisfied customers. Healthcare organizations that choose to manage their data more holistically and use advanced analytics and identity management tools to be more proactive with their patients or plan members have a key opportunity to cut costs and boost operating efficiency. Even more important, comprehensive data—and the right tools to access and manage it—can help organizations of all sizes do a better job of foreseeing and solving issues before they become customer service problems. A more proactive approach to using universal data, analytics and identity-management technology can help healthcare organizations connect all the dots of a patient and plan member’s formerly disparate pieces of data into a single, universal customer information file. That in turn leads to a healthcare organization achieving authoritative identity, the lynchpin in using data in a call or contact center to achieve better efficiency and, more importantly, patient satisfaction. In a highly competitive and rapidly consolidating industry, improved patient satisfaction and an excellent patient experience can help hospitals improve profits, help patients better manage chronic disease through better prevention and wellness and run a more efficient contact center that can help solve patient problems and challenges as efficiently and effectively as possible. For example, NYU Langone Health, a big cosmopolitan medical center with a base of 1.7 million patients, recently and entirely revamped its contact center to achieve higher patient satisfaction. The Langone contact center is a bustling and sprawling operation that employs 300 agents to handle more than 2.2 million calls, e-mails and texts annually. The key to operating a better call center that could be more proactive in anticipating patient needs and answering their questions and resolving their problems was giving contact center agents access to a single, comprehensive patient profile, even as the patient was calling, texting or e-mailing the call center, and a dashboard of better tools to access and update their data. Prior to the overhaul, the Langone contact center had no comprehensive data—or an authoritative identity—on the health system’s patient population. When a patient called, the service agent had to take nearly a minute to identify the patient, access their most recent personal information and then help the patient to determine the reason for the call, such as finding a new doctor or making an appointment. On average, it used to take between 4 and 5 minutes for an NYU Langone agent to handle a typical patient call, in part because agents had only limited information on the patient. But over the last 11 months, NYU Langone has addressed that issue by replacing outdated technology and isolated databases with new customer relationship management and identity analysis software linked to comprehensive patient information. With better technology, NYU Langone is reducing the average time it takes an agent to answer and complete a call to about 3 minutes and 30 seconds and to reduce the total time spent on calls by up to 1 million minutes annually. The new platform provides agents with a holistic and customized view of a patient’s needs by providing access to customer data and the patient’s electronic health record, which, in turn, enables agents to have more individualized and informed interactions with patients. All agents now have a single view of the patient, including medical history, insurance information, scheduled appointments and preferences. Data is made available in real time. Consumers these days have big customer satisfaction expectations when it comes to their healthcare. When they go online or make contact with a healthcare organization call center, consumers now expect to find service agents that can help them make better, faster and more informed decisions. For doctors, hospitals and health systems, consumers want websites and contact centers that help them find the right doctor or change doctors or an appointment quickly and conveniently and even see a doctor online. They also want help in finding out the cost of a particular visit or treatment and knowing what’s covered by their health benefits. From health insurers, consumers want easier and faster ways to enroll or renew their coverage and access their benefits. But first and foremost, consumers want easier and faster ways to research healthcare treatment costs, what their benefits are and what they would pay out-of-pocket for a given procedure or treatment. Today, many healthcare organizations have lots of data but lack the technology and expertise to turn that data into actionable and useable information that can be shared across the enterprise. It’s estimated that as many as 15% of medical records have erroneous information that’s tied to an incorrect identity. It’s also hard for a contact agent to respond to or anticipate a patient’s or plan member’s inquiry and troubleshoot problems when the agent may have outdated or incomplete information, such as an incorrect address, an outdated or wrong phone number, incomplete or only partial billing and financial information and no access to medical records. But healthcare companies armed with better and more universal data that’s integrated across the enterprise—from clinical, financial, customer service and other computer systems and accessible in real time by multiple users—can help improve profits and operating efficiency. For example, the most successful hospitals in 2018 might be those that focus more attention on the member experience. Hospitals with the highest patient-reported experience scores reported an average net margin of 4.7%. Hospitals with “low” ratings, by contrast, reported an average net margin on 1.8%. Establishing authoritative identity—or having a holistic view of customer information across the enterprise—can help hospitals and health systems in particular generate better outcomes by reaching out to help patients spot and seek treatment for a chronic disease sooner. At Langone, a holistic view of all patients’ medical and demographic information enables the health system’s clinical staff to better gauge patient risk, making it easier for providers to segment patient populations and target them for outreach. Langone can now identify patients 65 or older with diabetes, or patients who have been discharged from knee surgery in the last 30 days, and then have the contact center or the doctor’s office send them follow-up appointment reminders, surveys or educational materials. 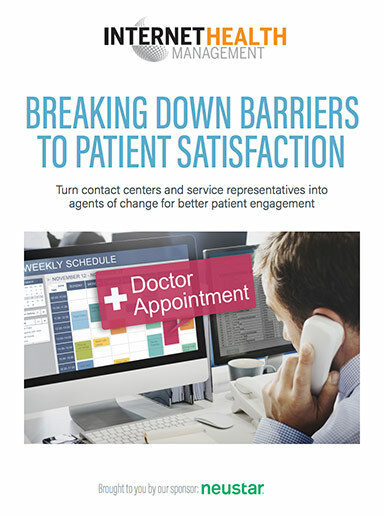 The contact center is the nerve center of patient engagement for hospitals and health systems. Approximately two-thirds of all U.S. hospitals employ call centers for a variety of purposes and that number is steadily increasing. Hospital call centers often direct or even triage calls to the appropriate provider, department, individual or patient room. A hospital also can have a more sophisticated call center that supports billing and collections, nurse advice lines, disease management programs and marketing campaigns. In a big national or regional healthcare delivery system, call centers also could be operated to support diverse parties such as physicians, suppliers and health plans. In many ways, the call center of a health plan has become the strategic center within any healthcare system because of its increasing importance in the patient communications cycle. Patients make heavy use of contact centers. Research reveals that 60% of callers to a health system contact center are repeat callers, 20% of all hospital customers use the call center in a given year and repeat callers use more hospital services than one-time callers. Patients also are quick to share stories of bad experiences, especially on social media. That’s because patients value health systems that value them. Personalized care from providers—including clear communication and sensitivity—is respondents’ No. 1 healthcare priority, according to a recent Deloitte survey of healthcare consumers. Healthcare organizations that meet expectations in a new era of consumer-driven healthcare by embracing the concept of authoritative identity and using more universal data integrated from across the enterprise and identity management technology can capitalize on a big opportunity. That opportunity is turning a contact center and service representatives into true agents of change for better patient engagement and satisfaction.